Regardless of the level of automation a lot of business applications implementing provisioning, verification or approval workflow will be always dependent on the human decision. Getting this decision in a real-time can significantly simplify and streamline the critical business processes. Infologica Fusion Framework helps to mobile-enable your business processes and provides comprehensive platform for extending the reach of your enterprise applications. This platform is capable of handling the context synchronisation and 2-way communication between Infologica Fusion Server and mobile device. 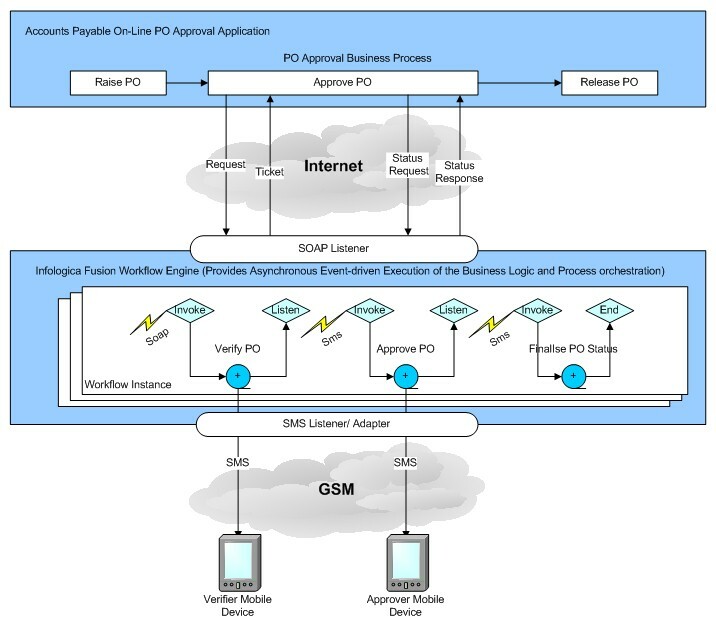 The diagram below is a classic example of the on-line PO Approval business process which delegates the complex multi-step approval routing to the Infologica Fusion Framework. Infologica workflow management engine allows to break the workflow approval business process into the smaller reusable units of execution (activities) and invoke them asynchronously across and beyond the enterprise within the same application context using sophisticated Infologica Fusion event-communication infrastructure featuring SOAP/SMS Listeners and Adapters. In this example the client application sends a single SOAP XML request to the Infologica Web Services and further just queries the PO Status using the ticket issued by Infologica Fusion middleware. Triggered by the web services client request the Infologica workflow engine creates the new instance of the PO approval workflow and invokes the first activity which sends SMS message to the nominated mobile user for PO Verification using Infologica SMS Adapter. The current workflow instance is placed hereafter into the waiting mode. The next step of the workflow is actually triggered by the mobile user (PO verifier) who sends SMS response to the Infologica SMS Listener. The workflow engine validates the SMS response from the verifier, wakeups the appropriate workflow instance and synchronises its context. Being responsible for all management control checkpoints and PO approval routing logic the workflow engine makes decision whether to proceed with the further approval or cancel the request. In case of successfull PO verification the next activity is invoked which sends SMS message to the nominated mobile user for PO Approval. The last step of the workflow instance is triggered by the SMS message from the PO approver. The workflow engine invokes the business activity which finalises the PO Status and optionally notifies client using Infologica SOAP Adaptor. Creating of the Workflow Definition for the above process using the Infologica Workflow Designer is covered here. 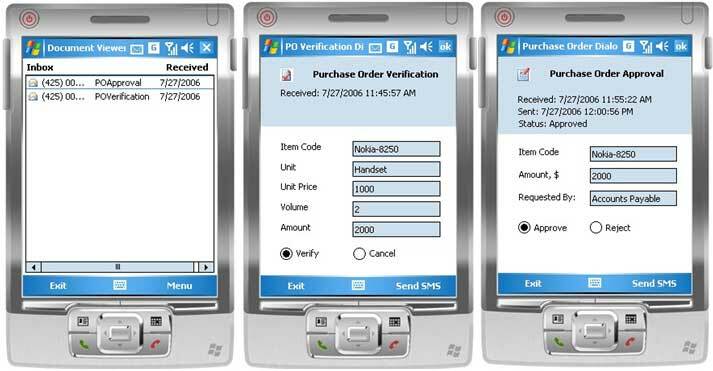 Infologica Mobile Document Viewer for Pocket PC and Smart Phones is a generic and extendible mobile application which uses SMS Message Interception technique and is based on the Infologica's philosophy of "GUI everywhere". It allows to configure mobile device to filter all inbound messages with predefined prefix and redirect them to the custom input box where they can be managed and processed by the document viewer extension forms. This way the mobile user involved in the workflow approval process does not experience the inconvenience and limitations of SMS communication but rather gets the intuitive visual interface which helps him to make the right decision in the short time with a click of a button. The document viewer allows to abstract mobile user from the message complexity hiding all technical details like unique workflow ID, etc. The software is also responsible for the inbound message validation and parsing as well as the outbound message compilation based on the user interaction. The document viewer also keeps the track of the document processing status. It creates the new reminder task on message arrival and automatically removes reminder after the message processing.